Lauren Capkanis and Brianna Fernandez in Sycorax, Cyber Queen of Qamara. BOTTOM LINE: In this top-notch feminist piece, the witch from The Tempest uses much magic and internet technology to tell her story. The time has come to inquire why men are so afraid of women. The old, powerful "witch" Sycorax (Sandra Bargman), mentioned (but never seen) in Shakespeare's The Tempest, starts the show by telling us that, centuries into her life, she is now using technology to retell her story; she even has a remote control which she uses to manipulate the characters. G. Warren Stiles's colorful, arabesque design nicely sets the scene. We see the young Sycorax (Lauren Capkanis) growing up as an outspoken girl in the city of Algiers. Her family delights in the Islamic culture of the city, which is under the control of the Sultan of Turkey. However, after being married off, Sycorax and her mother (Taylor Graves) agree that a woman should want more than to be the third wife of an old man (Michael Pichardo). Conspiring with her ancient husband's daughters (Brianna Fernandez and Hui-Shan Yong), who are her own age, Sycorax finds a more effective way to get pregnant. She also creates enormous rats to terrorize the Turkish lords. Her brother Rachid (Nick Giedris) has already denounced Sycorax for witchcraft, and her rat trick eventually gets her banished to the island of Qamara, which means "moon" in Arabic. Feminist symbols proliferate. 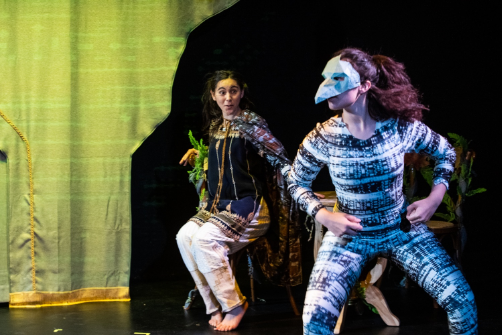 On her desolate island, Sycorax prepares to give birth, using her magic to create friendly animals (Kelly D. Cooper, Hui-Shan Yong, Taylor Graves, and Brianna Fernandez) that feed and dance for her. Her son, the hunchbacked Caliban (Michael Pichardo), grows up with a strong connection to nature. Sycorax finishes the long process of creating a perfect being out of the trunk of a tree. They name this beautiful, life-loving spirit Ariel (Nick Giedris) after the angel Gabriel. Ariel is smart and fully functional (as illustrated onstage by intimacy specialist Akia Squitieri). The scene is now set for the arrival of Shakespeare's "civilized," but far from innocent, Prospero (Kelly D. Cooper) and his daughter Miranda (Taylor Graves). Even those unfamiliar with the fantastical Shakespearean play will find much to admire here. Outside of mainstream, patriarchal religion, playwright Fengar Gael (and perhaps Shakespeare, too) shows us clever, oppressed people poised to overturn the establishment. The wonderful thing about Sycorax is that, unlike her toxic oppressors, she embraces nature, magic, and technology. Her open-mindedness spills over into all parts of this production, which suddenly becomes a sort of animal ballet in Act Two, thanks to Ioan Ardelean's movement direction and Jeff Sturdivant's costumes. Nick Giedris brings yet another layer of fascination as Ariel. At first, the unearthly spirit delivers only sung dialogue (backed by Ian Wehrle's music and much lighting fanfare, courtesy of Bruce A! Kraemer). This is magically modified to his only speaking in verse. Sycorax's final act of revenge is gratifying and should delight you, especially if you support women and their efforts to secure their rights in this world. Director Joan Kane has helped develop and stage a novel and relevant play that shows a woman, at the height of her powers, seeking to be herself, worship as she wishes (she draws power from the pagan deity Setebos), and simply live without being called a witch (something the patriarchal Abrahamic religions did often). If you want to see a play that gives voice to a maligned female literary character, this is your chance. Sycorax, Cyber Queen of Qamara is by Fengar Gael. Directed by Joan Kane. Set Design by G. Warren Stiles. Costume Design by Jeff Sturdivant. Lighting Design by Bruce A! Kraemer. Sound Design by Ian Wehrle. Projection Design by Kathryn Lieber. Movement Specialist is Ioan Ardelan. Intimacy Specialist is Akia Squitieri. Assistant Director is Jacob Nurick. Stage Manager is Sabrina Moore. The cast is Sandra Bargman, Lauren Capkanis, Taylor Graves, Nick Giedris, Kelly Cooper, Brianna Fernandez, Hui-Shan Yong, and Michael Pichardo.